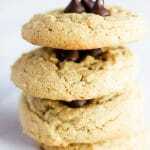 These peanut butter cookies are easy to make, soft, and delicious!! Every bite packed with peanut butter flavor, topped with chocolate chips to make them extra special. Cream butter and sugar together, about 1 minute. Add the peanut butter and cream together until light and fluffy, about 2 minutes. mix until just combined and all the flour is incorporated. Scoop 1-inch balls onto a greased cookie sheet. Bake at 375 for about 10 minutes. When the cookies are done, remove from oven. I like to press 3-4 chocolate chips gently into the center to finish them.